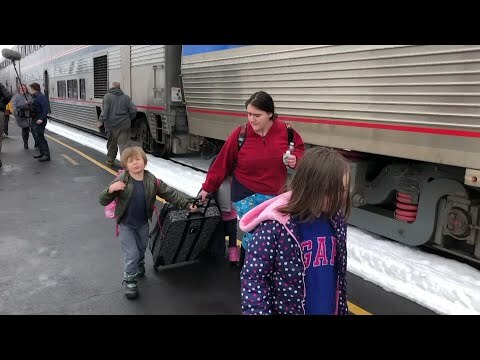 SALEM, Ore. (AP) — An Amtrak train with almost 200 people aboard hit downed trees during a blizzard and got stranded in the Oregon mountains for a day and a half, but passengers and crew banded together during the ordeal that ended Tuesday. “It was really nice to meet people pulling together,” passenger Tracy Rhodes, of Scottsdale, Arizona, said in a phone interview after the train that had been traveling from Seattle to Los Angeles rolled back into the college town of Eugene, Oregon, with a clanging bell announcing its arrival. Passengers spilled out, some waving their arms high in jubilation. During the 36 hours that the train was stuck, younger passengers helped older ones reach their families to let them know they were all right, said Rhodes, who was traveling with her brother to visit their 82-year-old mother in Klamath Falls, Oregon. A “mom brigade” was formed to take care of and entertain the children, she said. “This is hell and it’s getting worse,” Rebekah Dodson posted on Facebook after 30 hours, along with photos of herself and other passengers smiling into the camera. “The food hoarding has begun. I’m considering saving half my dinner steak and making jerky on the room heater,” Rhodes tweeted. She and her brother had sleeping berths. “We were fed very well. Steak at night, hot breakfast in the morning,” she said. Coach passengers were given beef stew with mashed potatoes, she noted. “With more than a foot of heavy snow and numerous trees blocking the track, we made every decision in the best interest of the safety of our customers,” Naparstek said, adding that customers would get refunds and other compensation. “Break free of congested airports and freeways to get up-close-and-personal with America’s spectacular West Coast. Hug rocky coastlines, glide beside the majestic Cascade Mountains,” the site says. “I am exhausted,” she told KOIN, a Portland TV station. “She is definitely disappointed, but is glad we’re safe,” she said. The train retreated to the north Tuesday afternoon, heading back to Seattle. Some passengers including Rhodes got off in Portland. The train’s journey further north was delayed for at least two hours, passengers were told, after a railroad bridge over the Columbia River between Oregon and Washington state caught fire.